A cast member recently asked me, “Wayne, what do you do for your day job?” I smiled, because guests ask me this all the time. They don’t know we employ almost a dozen people and could use a few dozen more. But I understand, we’re putting on plays: it must just be a hobby! We prefer the word calling. LifeHouse is a place for men and women of all ages to walk onto a stage and into a story and become like children. We don’t mean act childish; we mean imagine and believe as a child. 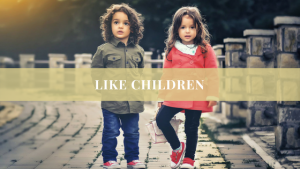 It’s not just a place for kids, but men and women with a job in the day, full of stress and responsibility, to remember and practice Jesus’ words, “unless you turn and become like children, you will never enter the kingdom of heaven” (Mt. 18:3). No one has to teach children to pretend to be someone they admire! They just need a stage–and it doesn’t matter if it’s the backyard, living room, or school auditorium. Inspired with the right source material they will slay the dragon, break the curse, rescue the needy. And we know this is good: for you become who you pretend to be. It’s the children who’ve spent their best years upholding what is good, true, and beautiful in the face of wicked wands and fiery darts that we want in our classrooms, offices, and government! Now, here’s the problem: many, if not most, of the stories from Hollywood and Broadway and Netflix are not preparing anyone to destroy evil and defend good, because they are too busy fumbling about asking if there really is a difference between truth and error, good and evil, beauty and ugliness. Or, as Satan once asked: Did God really say that? A steady diet of those stories won’t produce the men and women we need in our world today. At LifeHouse, we know we need to meet men like Joseph and Ben Franklin and women like Esther and Anne of Green Gables. So, yes, my (Wayne) day job is connecting people all across the Inland Empire with heroes like that, and what a calling it is! I’m always so encouraged by your words and shows! I can’t wait to audition some time soon. Thank you for your selflessness.